The B.C. Green Party is pledging to introduce a 'guaranteed livable income' aimed at eliminating poverty if elected in May. The B.C. Green Party is pledging to introduce a "guaranteed livable income" aimed at eliminating poverty if elected in May. 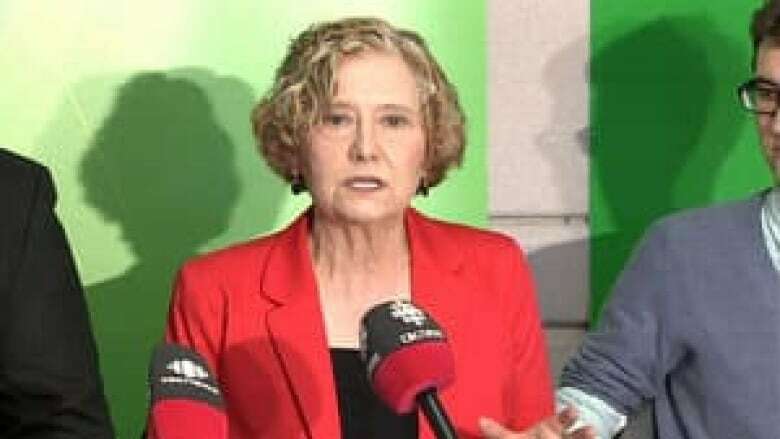 "We can eliminate poverty, but the only way we can do that is through a guaranteed livable income," party leader Jane Sterk said today in Victoria. "When Green MLAs are elected, we will either introduce a bill or support a bill from the government to explore through an expert commission, an expert panel, how we could implement a guaranteed livable income in British Columbia — a made-in-B.C. guaranteed livable income. "We know that at the moment there is a lot of cost in sustaining people in poverty. Those costs are borne in the number of ministries that a family has to navigate, in the number of programs that the government offers." Sterk said it’s time to rethink how the province approaches social services, and focus on moving people out of the cycle of poverty. "We need to stop just tweaking our social services and to start really addressing the issue that people are most concerned about, which is the amount of poverty that we have in British Columbia," she said. "We know that families and individuals in British Columbia who are caught in the cycle of poverty have really no hope in exiting that cycle and certainly tweaking the system that we have now with small amounts of money is not going to solve the problem." Sterk called on the province to reduce the number of ministries and bureaucrats, which she says could leave enough money to fund the guaranteed livable income. She said the provincial government should focus on funding childcare and housing for low-income families, as well as providing parenting classes and skills training. "Right now we spend an awful lot of money keeping people in the system, keeping people in the poverty cycle — $1 million a day on the Downtown Eastside is spent in the poverty industry, with no appreciable positive effect on the people of the Downtown Eastside," she said. "We spend $40,000 a year keeping a child in government care, and many of those children are removed from families who live in poverty … and that’s often the result of the stress of living in poverty." Sterk said the party would use Statistics Canada’s low-income threshold, which varies depending on the size of the family and the community, and ensure no family lives below that line. "We don’t see things like poverty as a societal thing. We see them as individual. And it’s very easy for us to point to an individual and say, ‘I would never end up there’ or, ‘You got there because of your own decisions’ rather than understanding that poverty is multi-generational … and it is really a societal issue," she said. "I think we’re at a cusp where we’re recognizing that things aren’t working and that we do need to change our mind and do things differently."